The goal of the Inveneo Partner Programs (IPP) is to provide an in-country ecosystem of technology companies that provide skilled and cost-effective installation and support services for organizations in need of life-impacting ICTs. There are over 120 partners in our Inveneo Trained Startup Entrepreneur (ITSE) and Inveneo Certified ICT Partner (ICIP) programs serving 24 countries around the world. Through the Inveneo Partner Programs, client organizations serving rural and remote communities benefit from lower total costs, improved support, and access to ICTs that increase their capacity to serve. Contacting an ICIP or ITSE to design and install ICT solutions reduces average system installation and support costs by as much as 70 to 80 percent and overall project costs by as much as 60 percent, through a combination of lower local-labor fees and the elimination of Inveneo travel costs from the US. Local support also decreases service response times and improves overall service levels, thus lowering overall project risks for clients. To find the partner that can best meet your expectations, first look below for which type of partner best fits your needs and then select a country. If you do not see your country listed, and are interested in an appropriate ICT solution for your organization, please connect with Inveneo for assistance. 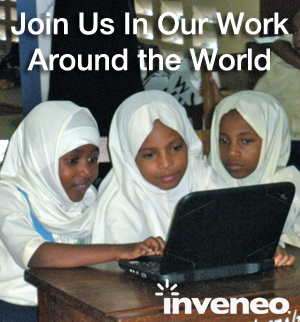 If you’d like to read more about what Inveneo partners have been doing in the field check out our Case Studies. Inveneo Trained Startup Entrepreneurs ITSEs are high-potential, promising entrepreneurs that start their own ICT businesses to become financially self-sufficient. Inveneo Certified ICT Partners ICIPs are established companies that have a track record of ICT innovation, delivery & maintenance within the communities they serve. Inveneo Power Partners provide power design and installation for all types of rural power systems using solar, battery, generator, and partial-grid power. How Will Inveneo Monitor 100 Internet Sites in the Future? Subscribe to the Inveneo Newsletter for updates on our progress in connecting those who need it most.